To cap off the day, here is an unused postcard showing a beautiful full moon over Montreux, Switzerland, which is located on Lake Geneva, at the foot of the Alps. The area's history as a human settlement dates to at least a few hundred years BC. Montreux's beauty has drawn many creative figures, including David Bowie, Noël Coward, Zelda Fitzgerald, Freddie Mercury, Igor Stravinsky and Shania Twain, to its shores over the years. 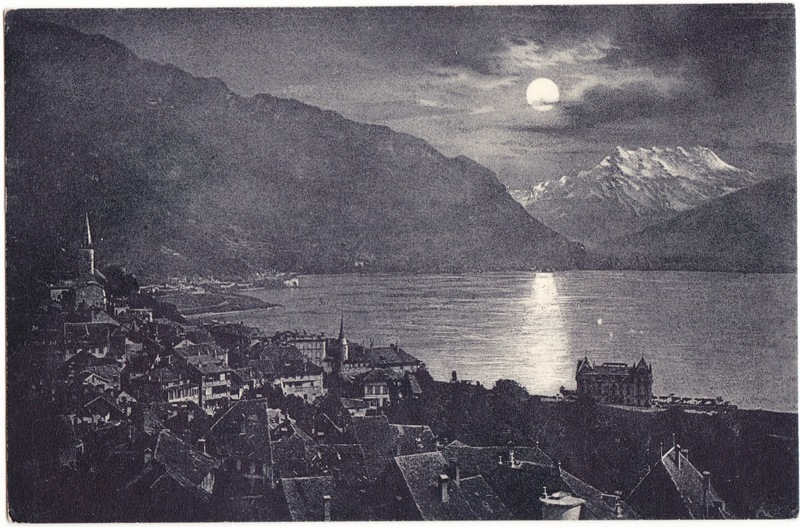 The caption on the back of the postcard, written in French, states "Montreux au clair de lune," which is pretty straightforward — Montreux in the moonlight or Montreux by moonlight. The tiny logo on the back of the card, shown magnified at right, appears to be for a publisher called "B & Co." The additional information printed on the back is: "Nr. 351 G. Anderegg, édit., Chillon." Any additional information on this publisher would be appreciated. This postcard is too cool to go back into a box, unused. If you'd like me to mail it to you, be the first to drop me a line at chrisottopa (at) gmail.com. Vintage Christmas card from Father: "Bright Days Always"
Postcard: "The Tower and Hotel, on Mount Penn. Reading, Pa."
Woolworth Building at night and George Homiak of Atlas, Pa.